Basement Finishing or remodeling is probably the one area of your Michigan home that really carries the most potential for a home remodeling project because it will literally double the living space available within your home without expanding on your property. Obviously doubling your living space contributes to a higher resale value of your home if you are planning to remodel and move too. Because of all that available space, there are several options available to homeowners who wish to turn these often unused areas of the home into a more beautiful and functional living space for your family. In the case of a rental suite, you could even turn your basement into an extra source of revenue. 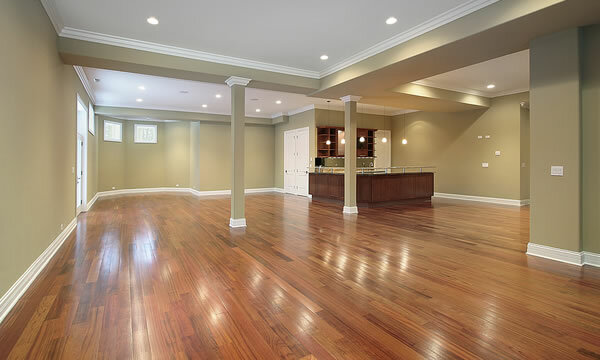 Generally, Basement Finishing projects are easier than stand alone room or home additions because most basements won’t need any exterior construction, aside from a window installation or two. Your basement may already have plumbing and electrical systems already in place, which is another factor that can help keep costs down. Finishing basements is a cornerstone of our business at Hubble Construction and Restoration and something our skilled carpenters take great pride in. There are many different directions we could go with your basement such as adding a home workout area, additional kitchen or bathroom, family room or playroom, and we can even add windows and proper lighting to brighten it all up. Hubble Construction and Restoration will work with you to design and build a basement that suits your living needs. The options truly are endless but as you can probably tell you don’t want to trust your basement remodeling project to just anybody. Let Hubble Construction and Restoration show you why we we’re different. With a well thought out basement remodeling plan a finished basement can be a major plus to your home. We can help you realize that! We understand you’ve got many contractors to choose from in Michigan to complete your basement remodeling project. We just want you to know that when you choose Hubble Construction and Restoration to complete the basement on your home you’re not just getting a contractor. You’re taking on a valued partner with years of experience in making Michigan homes more enjoyable, more suitable places to live for families just like yours.